"Today I didn't even have to use my A.K., I got to say it was a good day"
Lady In Satin is ranked as the best album by Billie Holiday. Members who like this album also like: Kind Of Blue by Miles Davis, Mingus Ah Um by Charles Mingus and In The Wee Small Hours by Frank Sinatra. 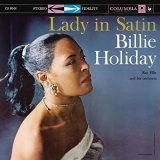 Related links: top tracks by Billie Holidaytop tracks of the 1950s, top tracks of 1958. Showing latest 5 ratings for this album. | Show all 273 ratings for this album. Related links: top albums of the 1950s, top albums of 1958. Her voice is heartbreaking and very very touching and strong... an album to listen to in a melancholic afternoon. Fine ballad based suite. Ray Ellis and his orchestra made a superior batch of musical arrangements. As mentioned previously Billie's voice was shot after years of hard living and sadly not long for this world. Something of a triumph that this record even exists. A beautiful album. Lady in satin, is full of haunting, aching ballads that in lesser hands would sound like easy listening. Billie Holiday puts her heart and soul into these songs, her voice cracking with emotion and experience, it's certainly shot by this time but it's as authentic as ever. There are brilliant versions of, I'm a fool to want you, glad to be unhappy, and, you've changed, with, for heaven's sake, and, i get along without you very well, also highlights. This is a real singer, like Sinatra, someone who lives the song, at least for the time they're singing it, putting recent versions of these songs by legendary rock stars to shame. Great album. I like her voice, but this just isn't my kind of music, I guess. This feels so much more mature than, say, Sinatra's "In the Wee Small Hours." A whole rich set of experiences and life perspectives is revealed through phrasing and intonation alone, even using a familiar set of standard lyrics. A pretty remarkable achievement. The best album from the best jazz singer of the golden age. Her voice is surprisingly... creepy! I mean that in the best way possible... wow, heartbreaking indeed. I felt heartbroken by the imperfection of her voice on this one every time I listened to this... For Heaven's Sake is one of the most beautiful love ballads I've ever heard.